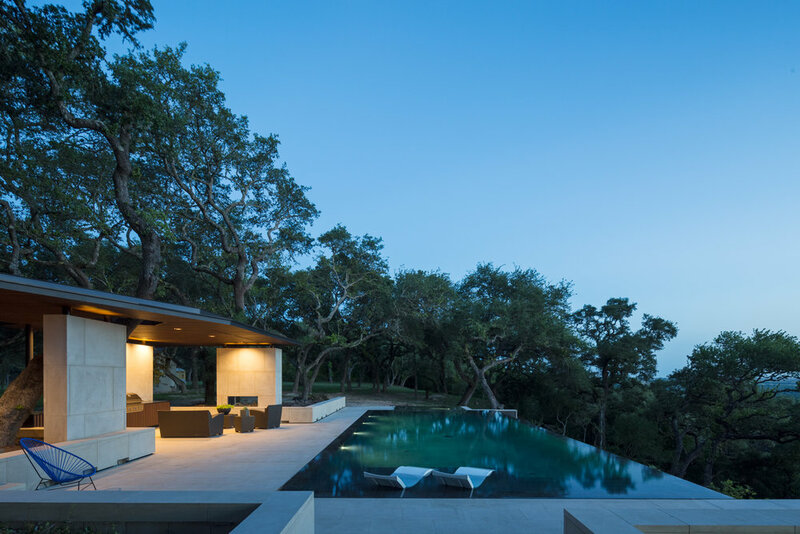 This project was created as part of a landscape intervention for a house perched on a bluff overlooking the forest and farmland of Colorado River basin seventy miles east of Austin. 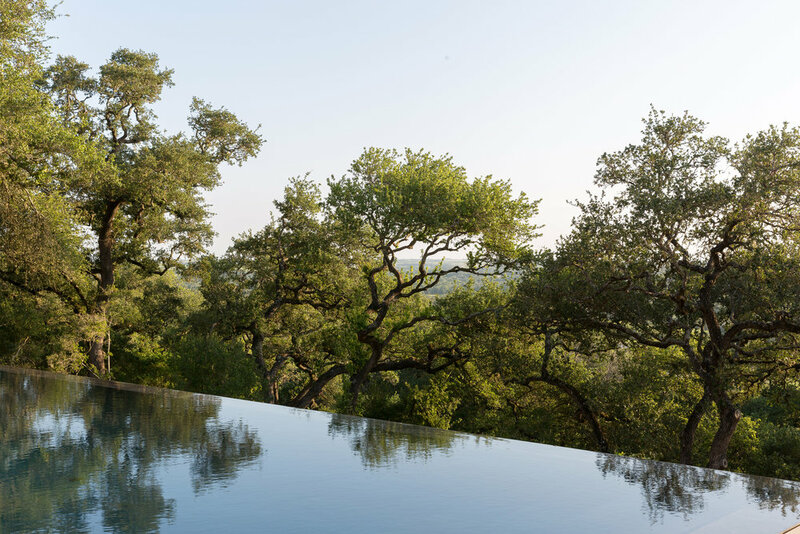 Surrounding views offer a quintessential display of central Texas wildlife and landscape: songbirds chirping in gnarled oaks on the bluff, hawks and buzzards spiraling on warm updrafts, morning mists in the valley below dissolving in the heat of the day, and ending with the long shadows of a low sun or the dramatic colors of an overcast sunset. The homeowners envisioned an outdoor patio area that would enable them to enjoy this incredible landscape throughout the year. 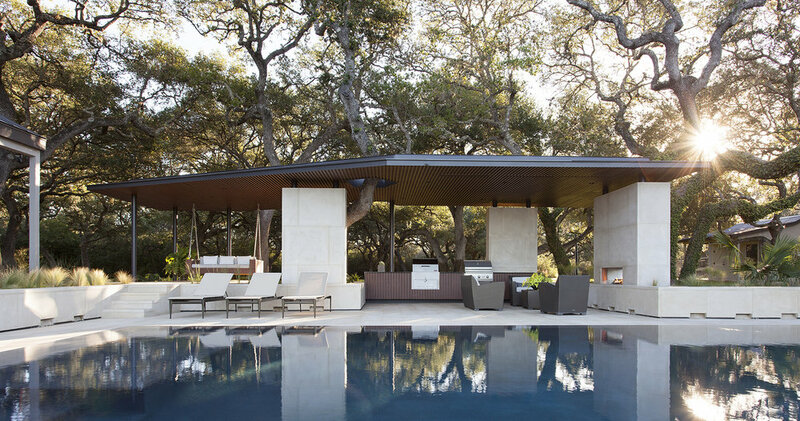 Situated on the bluff’s edge, a series of outdoor “rooms” weaves amongst the trunks of a live oak grove adjacent to a new swimming pool. A continuous expanse of creamy Lueders limestone pavers delineates the habitable areas from the surrounding natural landscape while creating retaining walls, planters, steps, benches, and flooring surfaces. 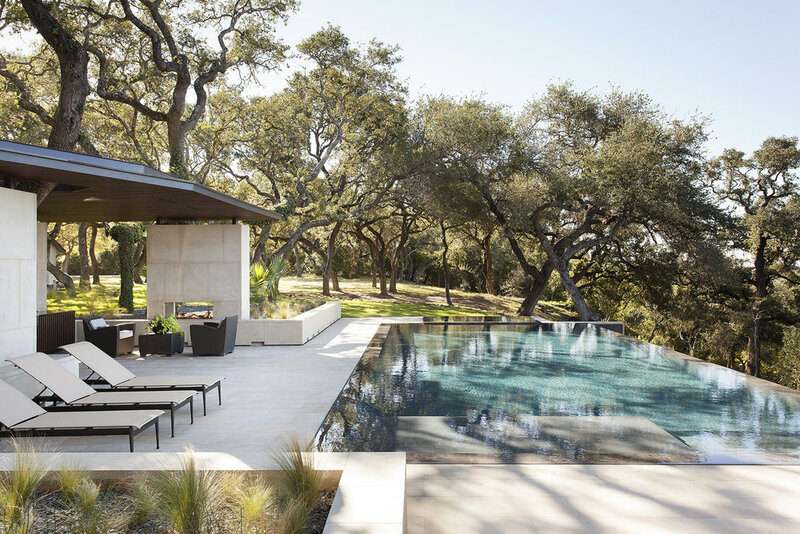 The various individual rooms–outdoor lounge, grilling station, dining area, and pool deck–are unified into a single fluid space as it steps down with the natural slope of the topography. Rising seamlessly from this horizontal surface are three large limestone columns that support the roof along with a series of thinner black steel columns around the perimeter. The largest limestone column, adjacent to the dining area, contains a pass-through fireplace. Overhead, a delicate roof spans between the lounge, kitchen, and dining areas to protect from both sun and rain and create a feeling of enclosure. 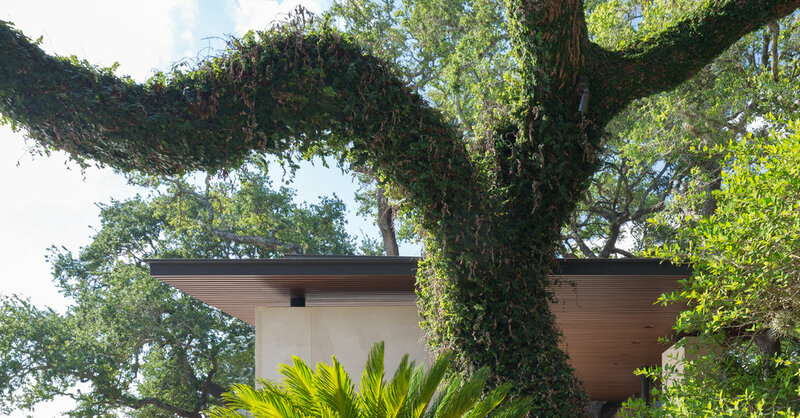 Rather than cutting down the site's gnarled trees, Murray Legge Architecture arranged the outdoor rooms to avoid the root zones, and created holes in the roof canopy so branches could pass through. Four thin, black columns disappear into the surrounding tree trunk silhouettes to produce the illusion that the wing-like roof floats in the grove. 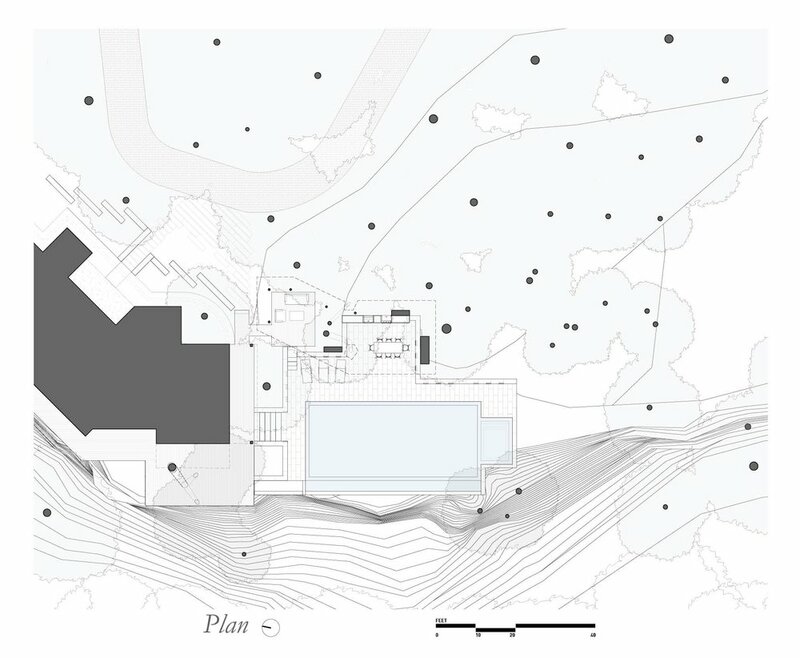 Along the western boundary of the site, a swimming pool extends beyond the point where the bluff drops precipitously. 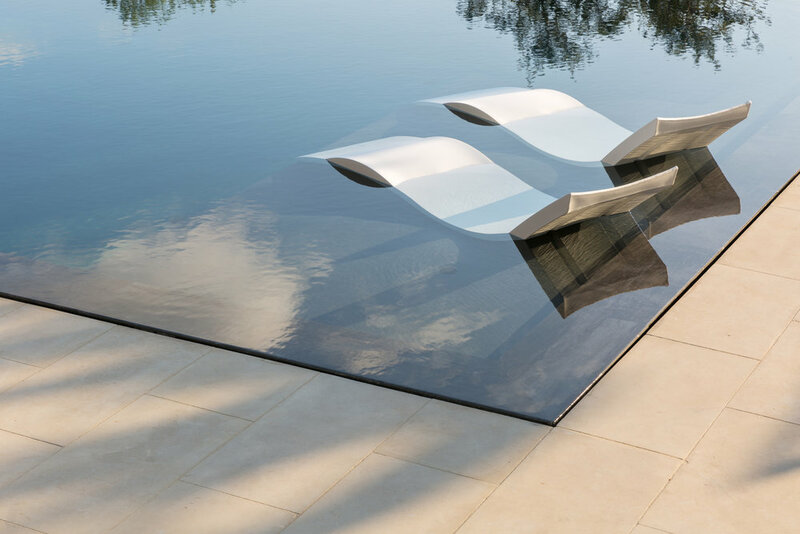 The perimeter is designed so the water laps right up to the stone pavers of the pool deck on three sides, and seemingly cascades over the cliff into a surge tank on the fourth. The trees and sky are reflected along this zero edge–a mirror image of the surroundings softly distorted and blurred by the rippling water surface.